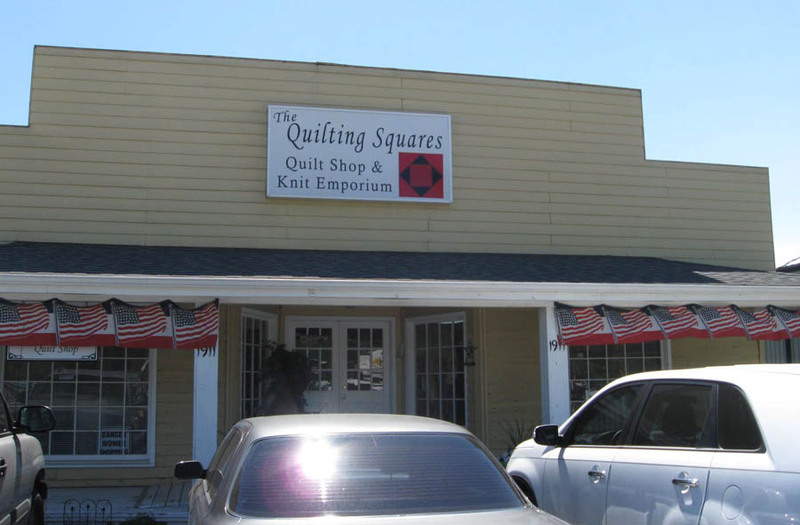 In another part of Franklin, Tennessee, is The Quilting Squares Quilt Shop and Knit Emporium. 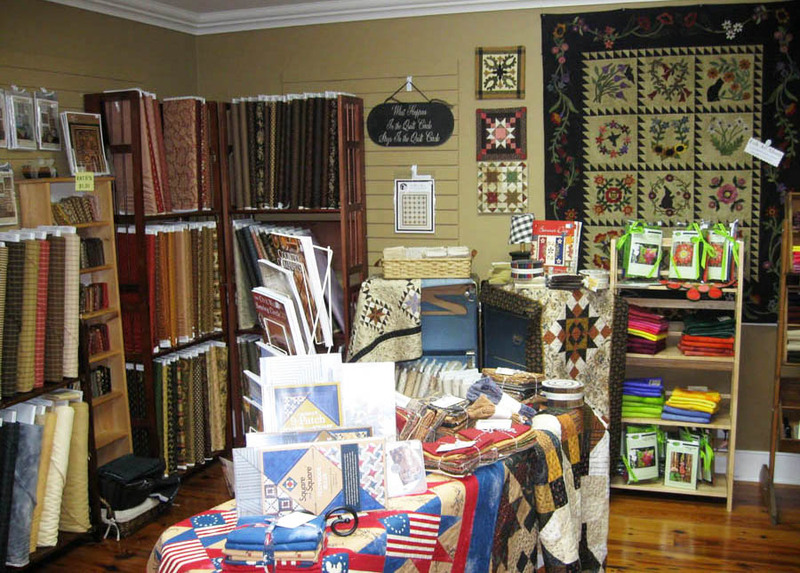 Owners, Kathy Kuryla and Kay Roberts, have been in business for a number of years. Their quilt shop, which has grown and outgrown a couple of buildings, is now located at 1911 Columbia Avenue in Franklin, Tennessee. 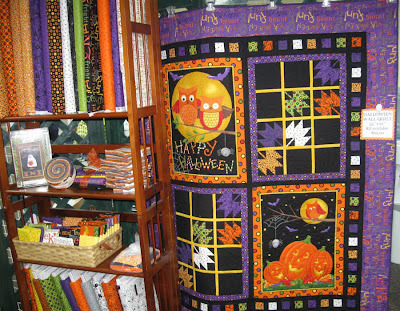 The Quilting Squares Quilt Shop. 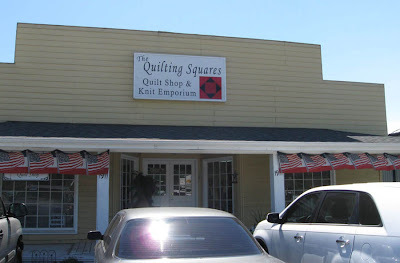 Kay and Kathy are experienced quilters and are certified in the Square in a Square technique. 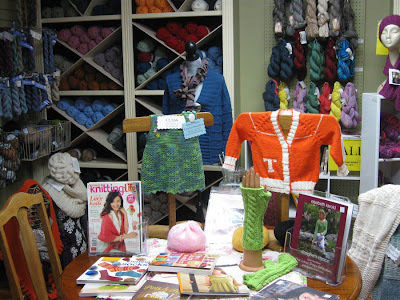 The shop offers classes in this and other techniques, and during my visit, a group was gathering for a sit and stitch at a large table at the big picture window at the front of the store. An appliqué BOM on the wall. As you wander through several rooms in the shop, you'll find cute displays of their merchandise including patterns, fabric bundles and pre-cuts, kits, books and quilting notions. During my visit, the store was decked in a patriotic red, white and blue theme for the 4th of July. 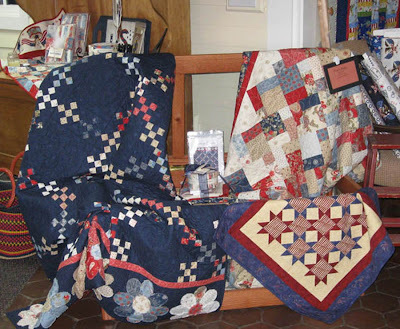 A red, white and blue patriotic quilt display at Quilting Squares. 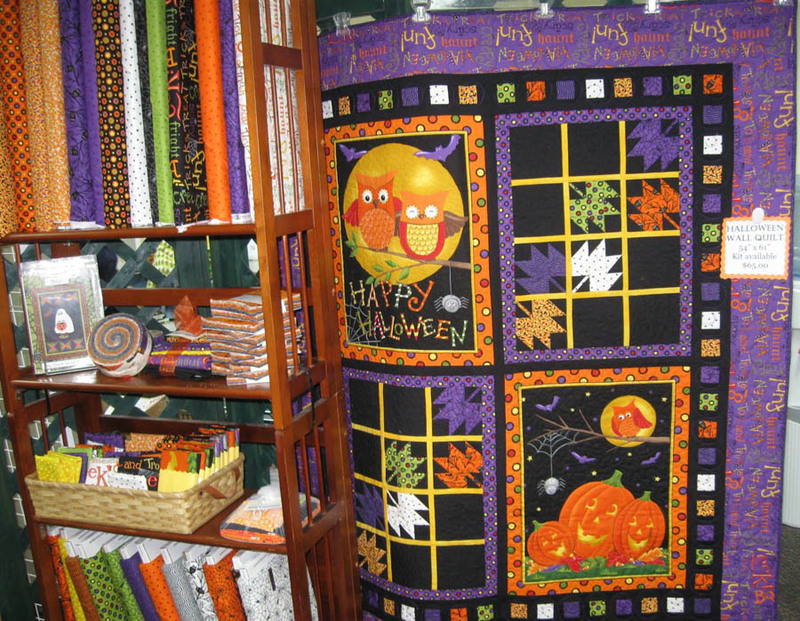 There are fabrics and adorable projects for other seasons and holidays—Halloween, Fall, Thanksgiving, Winter and Christmas. 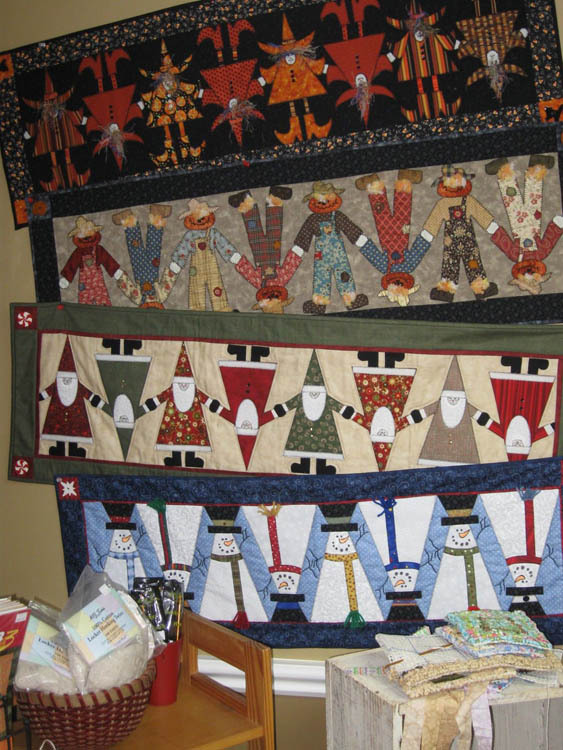 Make a quilt for every season and holiday! A table runner for every season. 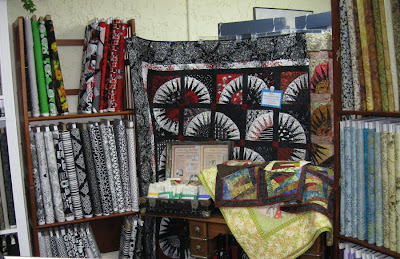 A New York Beauty paper pieced quilt in black/white and red. They have a nice collection of black/white fabrics on the shelves. 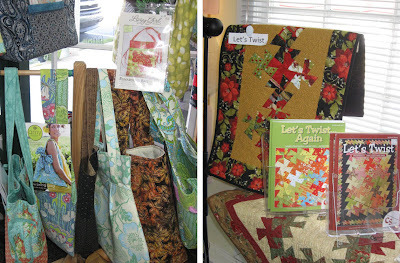 Lazy Girl and other bag patterns are still popular, as well as kits for smaller quilts and quick-to-finish projects such as runners and toppers. Quilting Squares had a nice selection of threads for quilting, sewing and hand embroidery or embellishing for primitive designs. 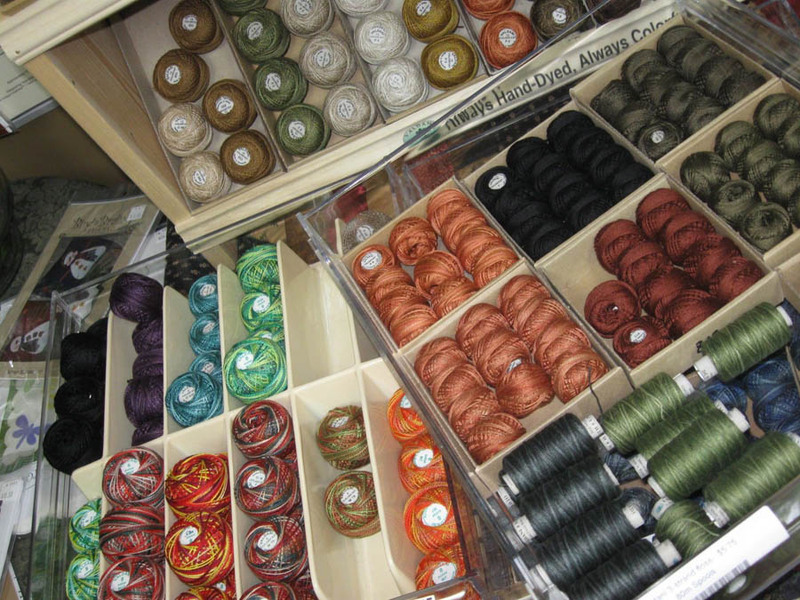 Decorative threads and perle cottons for hand needlework and embellishing. 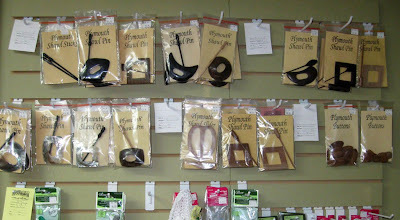 A couple years ago, they added yarns and knitting and crochet supplies, but are phasing out this area. 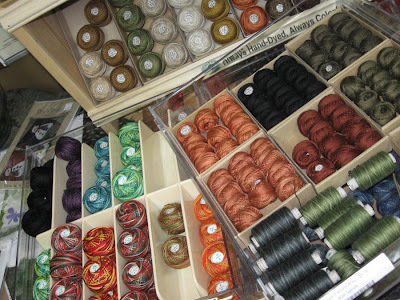 So if you have a passion for fiber that comes on a skein or hank, they had a 50% off sale going until it's all gone. If you're looking for great shawl pins as closures for your knitted pieces, contact them today (615-794-4769) and take advantage of the sale, or try their on-line store. They had some beautiful pins by Plymouth still in stock. Tell them I sent you! Knit shawl pins are going fast. As you walk through the shop, you'll feel the light, comfortable atmosphere and be attracted by the inspiring displays of projects that you'll want to take home and make. To reinforce the congenial setting of the shop is this sign that hangs above the archway, "Love, Laughter, Friends always Welcome." "Love, laughter, friends always welcome." The ladies here were warm and welcoming. They had a really good choice of kits and fabric. If I lived around here this would be a definite hang out.